I think being bossy about eating these biscuits can only lead to good things! I would love having these to start the day. They sound delicious and that blueberry butter is just perfect. Wow – what a delicious looking biscuit. Love the addition of flavored butter. Congrats on Top 9!!! That blueberry butter sounds fantastic on those warm biscuits.. Mmmm mmm! Can't wait to hear next month's theme! Hi Anna, Thank you so so much! This is such an unexpected, surprising pleasure. I joined just for the fun of it, and I'm so thrilled that it was so well liked. I also have something for you. You have been such an inspiration. I love coming to your blog, and discovering those small tricks that is making my baking life so much more easier. I am so happy to tell you that I have awarded you THE VERSATILE BLOGGER AWARD. Love biscuits and these look fantastic and I love the presentation as well as that blueberry butter. Beautiful. oh sour and sweet! 🙂 im craving for it now! Seriously send them my way. Holy heck I am beside myself staring at these lime biscuits. Be bossy all you want as long as these come with a side of bossiness. Amazing idea to add lime! You know, I don´t find buttermilk here, it´s nonexistent, so I always substitute with some lemon juice and milk. Never thought of adding lime though. I love these biscuits even though I am not obsessed with lime. This is totally my kind of coffee break, and blueberry butter?? That just sounds fantastic..
Can you bring those by? I'll make the coffee and tea? My mouth is watering! Have a fab day sweetie! Sounds like the perfect way to start your day! Blueberry butter is a great idea and I love the lime biscuits. This looks phenomenal! I have a ton of blueberries in the fridge so I definitely have to whip up some of that blueberry butter this weekend. Let me know how you like it, Aly! Thank you! Right? 🙂 Thank you, S.V.! 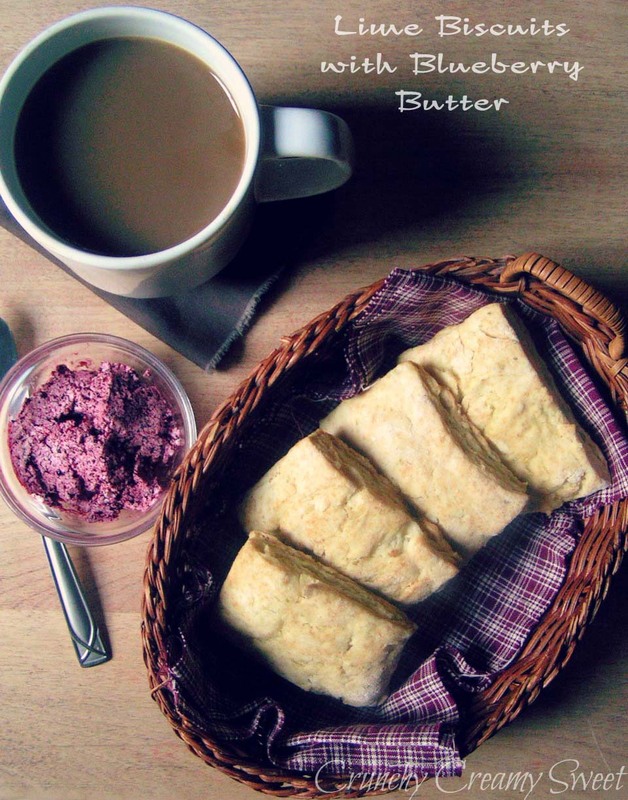 Blueberry butter, what a brilliant idea!! Love the blueberry butter! Great recipes – thanks for sharing. Congratulations to Minnie! Thank you so much Stephanie, you are a heart. I'm so glad we met. Let me know how you like it, Neshanne! Thank you! No need to persuade me to eat this for breakfast! This sounds fantastic! I want to have coffee at your house. That looks amazing! I love the thought of blueberry butter spread onto a lime biscuit which I'm sure is so good even on its own. Yes, they are 🙂 Thank you, sweet Ellen!